I finally finished my tags for Karla's Birdsong Tag Swap and I'm mailing them off today. Since there are over a hundred participants and we only had to make seven tags, chances are that the recipients of my tags won't read my blog until after the tags are received so I'm sharing my tag now. I collaged one side of the tag with music paper and then dry brushed both sides of the tag with a pretty yellow paint. Then I wrapped the entire tag with a pretty blue mesh ribbon. The sweet bird is a download from The Graphics Fairy. 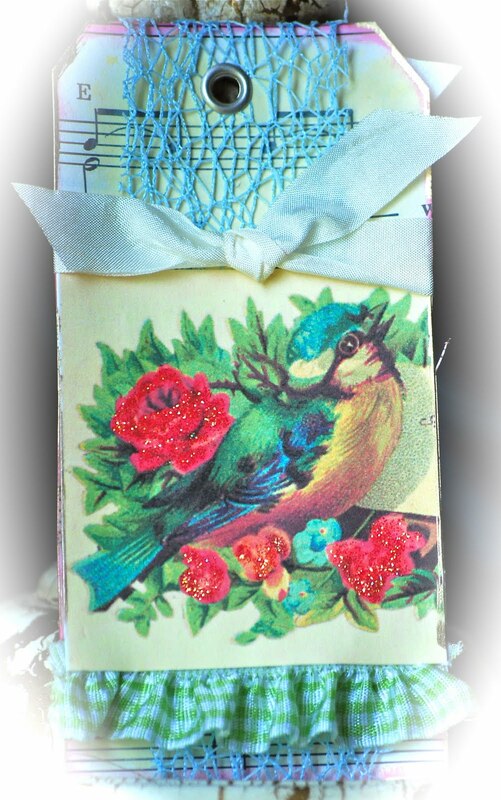 I added the green gingham trim and attached the bird to the tag. Finally, I added a grommet to the top and attached a tag to the back with my information on it. Karla will be packaging them all up this week and getting them in the mail along with a beautiful cover that she made. Can't wait! These are so cute! I love the colors. You have become the tag swap queen................I love all of them! Hope we can do some soon at the PC. Come see us soon and thanks for stopping by the blog. It was a great weekend. One to remember! Oh my goodness gracious -- I really love that and I hope, hope, hope I get one! The combo of the yellow, the green gingham and the blue mesh is just to die for! Your tags turned out cute. Are there really over 100 participants? Wow! I was in such a hurry to mail mine I forgot to take a picture of them. I can't even remember what they looked like! Beauty, happiness, pleasure, success, luxury, dissipation. The Empress is associated with Venus, the feminine planet, so it represents, beauty, charm, pleasure, luxury, and delight. You may be good at home decorating, art or anything to do with making things beautiful. The Empress is a creator, be it creation of life, of romance, of art or business. While the Magician is the primal spark, the idea made real, and the High Priestess is the one who gives the idea a form, the Empress is the womb where it gestates and grows till it is ready to be born. This is why her symbol is Venus, goddess of beautiful things as well as love. Even so, the Empress is more Demeter, goddess of abundance, then sensual Venus. She is the giver of Earthly gifts, yet at the same time, she can, in anger withhold, as Demeter did when her daughter, Persephone, was kidnapped. In fury and grief, she kept the Earth barren till her child was returned to her.